When I was a kid, the video games that we had were not exactly what I would call educational. Our first game system was an Atari. I loved playing Breakout and Pacman, but they were merely time killers. The first computer that my family had was one that my dad got from work when I was in high school. I took a couple of computer classes during school - in 7th grade math, we learned to program the TRS80 and at one point, I took some sort of Apple programming class. There weren't really "games" though that we played on the computer. Technology has clearly come a long way since I was a young child. My kids have access to a laptop, an iPad, and each has a DS. There are a lot of educational options when it comes to games for all of these technologies. 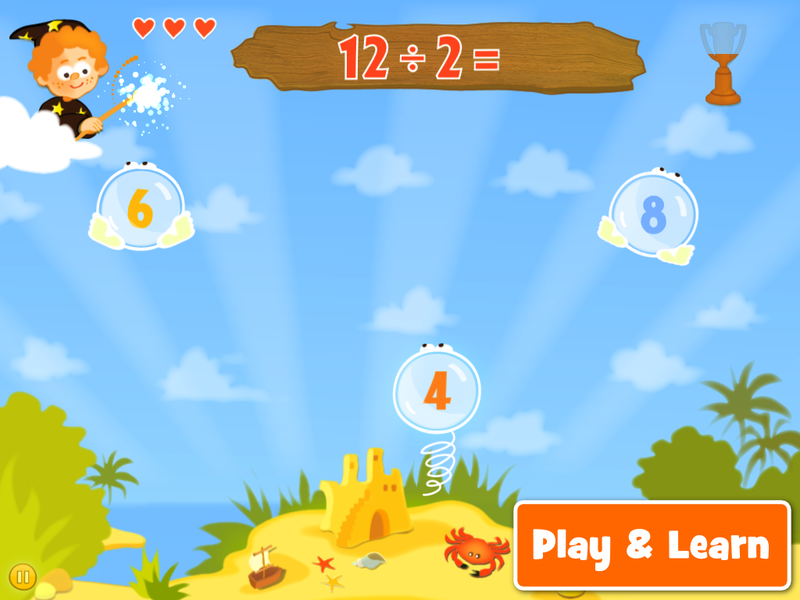 Recently, we had a chance to check out the Bubbling Math App for the iPad. It is also available for the Mac. 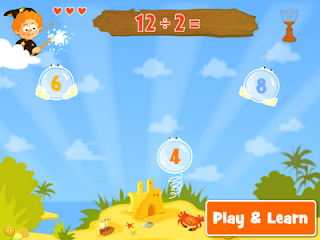 The app was developed with the input of teachers and children. The focus is on elementary math learned in grades 1 - 4. We are motivating - not only to learn, but motivating to continue with additional tasks, because when each new level is unlocked, your child can also get 3 cups for every level (Bronze, Silver, Gold) - and it is not easy to get a Gold cup!" My son was very excited to try it out (he loves math). He enjoyed playing with it for a while, but with as much as he loves math and excels at it, I don't think the game was providing enough challenge for him. We used the task configuration to adjust the difficulty settings and it once again was a challenge for him. For addition, you can go from easy to expert = additions up to 10 to additions up to 100. For subtraction, you can go from easy to expert = subtractions up to 10 to subtractions up to 100. For multiplication, you can go from easy to expert = multiplications of 1, 2, 3 (up to 30) to multiplications up to 100 with multiplication of 2 digit numbers with 1 digit numbers. For division, you can go from easy to expert = division of numbers up to 30 to division of numbers up to 100, including division by 2 digit numbers. Setting and adjusting the task difficulty is very easy to do. However, I wish there were a way to save the settings for different children. That way, they could just open up and start playing. As the two kids alternate playing, we have to remember to adjust the settings or they problems are too easy or hard. As a parent, I really like the reporting features of the game. The report shows a history of how many exercises were done by date and the percent correct. It shows which type of problems were done and how many were right and wrong. 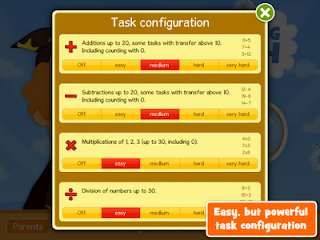 There are also settings which allow you to speed up or slow down the game to meet your child's needs. Surprisingly to me, my daughter, who is four really took a liking to the app. She of course stuck with addition on the easy setting, and really benefited from the multiple choice nature of the game. I was able to play with her and provide guidance on math. If the problem was 4 + 2, I would use the opportunity to walk her through starting at 4 and going up 2. She didn't always get the problems right, but she was at least trying. I figure at only 4, she has a couple of years before she will need to be an expert on simple addition and this is giving her a head start. You can pick up this app for $1.99 for either the Mac or the iPad. No compensation was received for this post. A complimentary copy of the app and information about the app was provided for the purpose of my family testing out the app and providing a review.